A stock plan is a Cope design that is in our inventory and is ready to be sent to a client immediately. It is generally a proven design that has been built numerous times. A stock plan usually costs about one fifth the price of a similar size custom design. This is a brand new plan designed to meet our client’s specific desires. A lot of our clients are able to use one of our stock plans with some simple modifications such as lengthening the cabin adding lockers…etc. 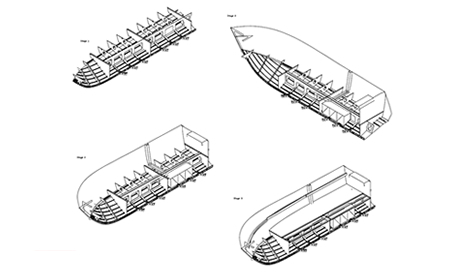 This consists of from two to fifteen pages of drawings that describe how to assemble the boat. These are very detailed drawings with lots of dimensions and isometric drawings describing how all the parts fit together. There are drawings that show the names of each part of the boat. These drawings are sent to you as digital drawings. 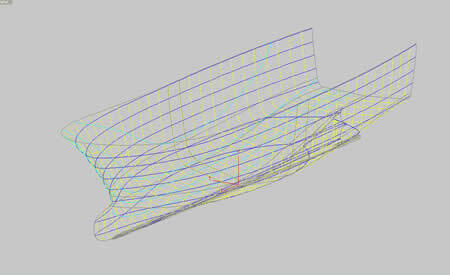 This is a CAD file with every sheet aluminum part of the boat laid out and ready to be CNC cut. The parts are all nested on standard plates of the correct thickness, and the correct alloy. We spend time nesting the parts to make the most efficient use of the aluminum sheets so there is minimal waste. Each part is identified with its’ name marked on it. The parts have line-up marks on them to help locate exactly where each part fits. 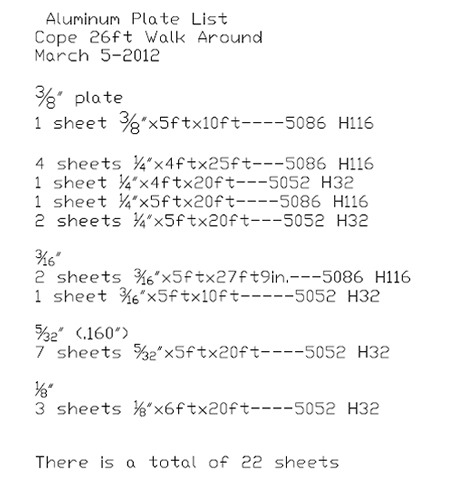 The cut file is sent directly to the company that is going to CNC cut your boat. The jig is a fixture that holds the boat parts in place during construction. The boat is built upright. The jig consists of a steel base and aluminum forms that hold the bottom plates in place. This makes for a much more accurately constructed boat. The jig plan shows how to assemble the jig, and the jig parts cut file has the aluminum jig forms nested ready to be CNC cut. 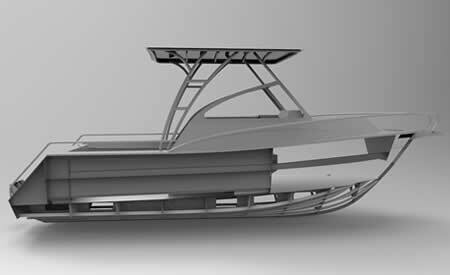 We create 3D renderings of our boat designs. These help our clients to visualize the finished boat. 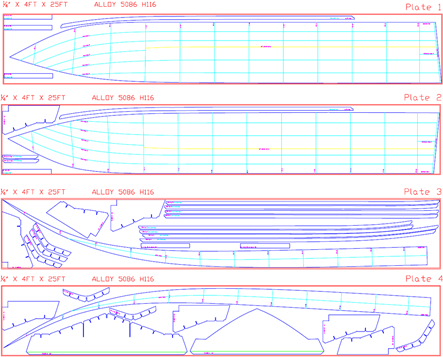 These renderings can show the boat from different view points, and different color schemes. Depending on how much detail we include in the 3D drawings we can make the renderings look almost photo realistic. 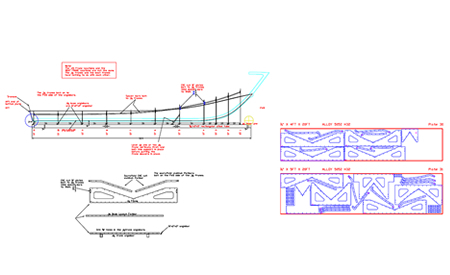 We do a weight study and LCG & VCG (Longitudinal & Vertical center of gravity) study utilizing spread sheets, as part of our hydrostatic calculations to ensure that the boat performs properly. A quote is a price from a local supplier for supplying the aluminum sheet materials, CNC cutting it, and press brake forming the parts that need it, for a particular design. Cost of the shipping will generally not be included.